In the 1970s & 80s, there would have been a generation of people who listened to Radio Two not knowing that one of their best-loved presenters, Jimmy Young, used to be a singer, crooning his way though ballad after ballad and was rewarded with two number one hits in the 50s. In the 2010s there will be a generation of youngsters who listed to Huey Morgan’s overnight show on Radio Two not knowing that he was once a member of the hip hop/rock/funk/jazz band the Fun Lovin’ Criminals. They released their debut single, The Grave And The Constant, in 1996 which reached number 72 they followed it just two months later with Scooby Snacks (number 22) and then The Fun Lovin’ Criminal (number 26) all of which were taken from the debut album Come Find Yourself which reached number seven and spent 72 weeks on the chart. Two years later came the follow-up and, so far, their highest chart album 100% Columbian which reached number three. Mimosa followed in 199 and then in 2001 came Loco of which the title track became their only top 10 hit single. Loco was more Latin tinged with a sample that sounded like Santana but was actually a track called Happy Anniversary ‘borrowed’ from Australia’s Little River Band, Huey explained the reason for the sound, “I was really going for that Santana tone on Loco. I’ve always been a big Santana fan. He’s a Latino, I’m a Latino, we both play guitar and though I never really try to copy the stuff he did, on Loco I wanted to get a little of that flavour. I had to listen to Abraxas a lot. Listening to how people approach stuff can give you a better idea. Carlos Santana was the guy – he played a Les Paul through a Marshall. Actually on Loco I played a ’59 Les Paul junior that I bought, which is a fat guitar and I put it through a Tech 21 going through a Fender Pro. Their last hit came a couple of years later, but Too Hot stalled at number 61. Their final album was in 2005, it was called Livin In The City and that spent just one week on the chart at number 57. 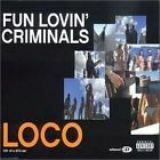 In 2010 they toured and released a live album called Fun, Live and Criminal but it too failed to connect. They’ve never officially announced a split, but Huey has since moved into television and radio. In 1996 he starred in Morgan starred in Clubbing to Death with Craig Charles and in 2008 he began presenting a show on BBC 6 Music and an overnight show on Radio Two. If you like something a bit different, then Huey’s show is fantastic because it really is his own personal record collection and it has every imaginable genre of music, just a shame it’s on at 3am. Thank God for the catch-up feature on iPlayer.